Roland TD-25KV Review 2019- Which Purpose Does It Serve Best? Roland TD-25KV Review – Which Purpose Does It Serve Best? I’m going to cut to the chase here: this Roland TD-25KV Review can only be useful to YOU if it answers YOUR questions, not mine. If you come out of this article not knowing if this drum kit will improve your drumming experience and accelerate your drumming your journey – I’ll have wasted your time. Of course, my intention is quite the opposite. So I went out and gathered the most burning questions from people interested in this high-end Roland e-drum kit. So imagine you knew the exact scenarios in which it makes sense to buy the Roland TD-25KV – and also the ones in which it makes sense to go for another e-drum kit. Because I hope that in a few minutes this will be reality – and that you’ll be able to decide whether the TD-25KV will enhace your drummming or not. Is The TD-25KV Worth Its Price? And don’t just take my word for it – also check out what Sean had to say after purchasing and using the Roland TD-25KV for his son and himself. In order to answer this question, I’ll need you to become clear about what you want to use the Roland TD-25KV for. Now, all of those purposes presuppose different functionalities – so I’ll cover them in turn and also tell you whether the Roland TD-25KV features those functions or not. Let me say this right away: Only using the Roland TD-25KV for practicing at home can be a waste of quality and money. I say that, because a practice e-drum kit only requires a standard setup (with bass drum, snare, 2 toms, a HiHat and 2 cmybals) and a line-out so you can listen to your playing via headphones, in-ear monitors or an amplifier. Depending on your living situation, mesh heads can also be a must, because hitting them causes much less noise than hitting rubber pads. The TD-25KV does meet all 3 requirements, but so do other drum kits that are much cheaper – so with the Roland you’d be paying a lot more money for only 1 additional cymbal that it comes with. So is there anything else that justifies using the Roland TD-25KV as a practice kit? The TD-25KV does feature a metronome, so you can train your timing; it also enables you to record yourself playing alone or to music so you can evaluate yoursel; and it also comes with a coach function that will have you emulate a beat and score you based on your performance. Yet, again, there’s another kit that does this at a much cheaper price. You’re looking to feel like a professional drummer while practicing in your basement. 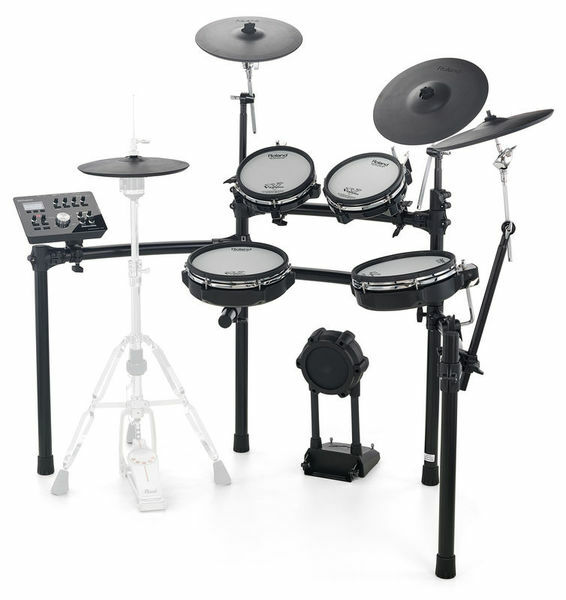 This is something that can’t be pinned down to particular functional requirements but will result from playing an e-drum kit by a premium brand that’s beautifully designed and made of quality materials. And you get more of all that with the Roland TD-25KV than with any of the other kits I’ve pointed out. So in that case, it does make sense to buy it. With playing live on stages (whether small or large) we come closer to what I think the Roland TD-25KV is destined for. For when playing live, you’ll most likely be putting on show (moving your head, waving your arms, doing stick tricks or whatnot) and in the heat of the moment, your strokes won’t always hit where they are supposed to. 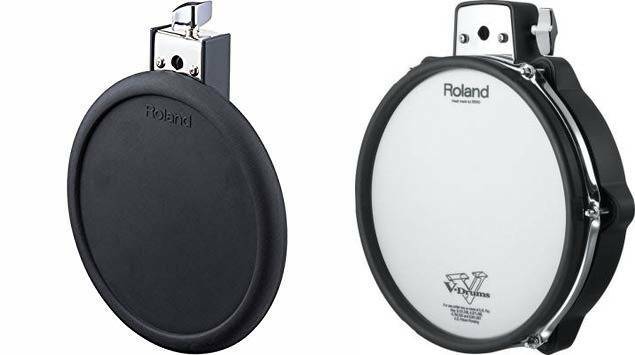 As such, it’s good that the Roland TD-25KV gives you bigger snare, floor tom and cymbal pads than many other kits (10” instead of 8” for the drums and 12” or even 13” instead of 10” for the cymbals). Also, the whole kit rests on a sturdy aluminium rack with 4 poles, so all your pads will rest firmly in place, even if you’re hitting very hard. On the downside, the Roland TD-25KV is about 20 pounds heavier than a kit with smaller pads and the mesh heads are will need more space when packed up. Of course, this is not an issue if you’ve roadies who set up your kit for you (I don’t though…). Another consideration – perhaps the most important one – on stage is the appearance of your drum set. Generally, this study says, you audience will even be more influenced by this than by your actual playing. Finally, all the pads of the TD-25KV are dual zone, meaning that they can emit 2 different sounds depending on where you play them (head / rim in the case of drums and bow / edge in the case of cymbals). The ride cymbal pad is even triple zone (adding a bell sound). This gives you all the expressiveness an acoustic drum kit would allow for too. The only real drawback of the Roland TD-25KV as a drum kit for the stage is, in my view, it’s price. And don’t get me wrong: I do think the TD-25KV gives you a huge range of functions that are useful for the stage – and that the quality of this kit is amazing. 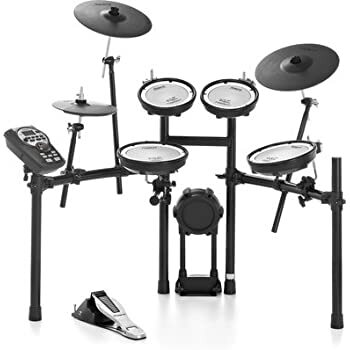 Yet, for it to really rock my world (pun intended), I would have liked the Roland TD-25KV to look even more destined for the limelight – like this one here – or to be cheaper. If money isn’t a concern of yours, though, I recommend the Roland TD-25KV as your kit for the stage all day long. Like the heading suggests, I’m primarily thinking about home recording here, because once you go record in a studio, you won’t have any of the concerns I’ll explain in the following. Instead, the sound engineer will take care of them. It allows you to connect your drum kit to your computer so you can use it as a MIDI trigger. That means, each time you hit one of your pads, this will register in your recording software on your computer and be recorded. Later on, then, you can overlay this recording with any sound you have in your sound library (and there are millions of sounds to be gotten on the internet). The Roland TD-25KV easily connects to your computer through a USB port at the side of the module. So it gracefully checks the professional home recording box. Yet, this kind of recording is for people who know their recording software (Reaper, GarageBand etc.) and sound libraries (Superior Drummer etc.). I’m not a master of that and honestly, I’m often too lazy to engage in this kind of recording. So is there an easier way to record your playing in good quality? Simply push the recording button on your module and later export the file onto your computer or phone. Now, any electronic drum set can do that, but the thing is that you won’t be able to modify that recording later on. So it better be good quality right away – and that’s where the TD-25KV’s real strength comes in. And finally, my most favorite feature of all: you can plug your favorite song into the module (for example via your phone), play along to it and the recording will capture both the playalong as well as your playing. Achieving this with most other kits is a real pain, since you have to record your playing individually, then export it to your computer and then overlay it with the drum track – with the catch being that both have to begin at the exact same split second. What’s the size of the box this kit comes in? Is it just one box? When buying from Amazon, the Roland TD-25KV comes in a bix box that contains 2 smaller ones (one for the stand, the other for pads and module). This bigger box measures about 63” x 42” x 39”. What is the footprint of the kit when it’s set up? Given that everyone likes their setup a little differently, the footprint shouldn’t exceed 5ft x 5ft. Does it include a kick pedal? No, you’d have to buy that separately. That depends on what you want to do. You can either listen to your drumming “alone” through headphones or in-ear monitors – so the outer world will only hear your sticks hitting the pads. Or you can externalize the sound emitted by the volume through an amplifier – so everyone around will be rockin’ with you (or come complain that it’s too loud). Imagine your friend, a fellow musician, a recording label or whoever you might give a recording to, tell you: “This sounds freakin’ good” – and you replying: “Yep, I made it in my basement”. That – home recording – is what I think the real strength of the Roland TD-25KV is and what also justifies the price tag – for having quality recordings produced for you by a professional is much more expensive. One recording would most likely cost you even more than this whole kit (which you can keep for life). So if you want to home record, the Roland TD-25KV is my top recomendation. For practicing and playing on stage, the TD-25KV also check all the boxes, but I think you’d be better of with this kit for practicing – and with this for playing on stage. For about 8 months I researched E-Kits for myself and my 12 year old son. Price, quality, durability and more importantly expandability. Initially I looked at the Alesis Forge kit, but could only find beat up used ones. I started to look at a command kit since it had the expandability I was looking for. Then I got a chance to play a Yamaha DTX 520 kit, I liked the feel of the heads over the Alesis kits, but due to issues with my local vendor I started looking elsewhere. After another couple months I got a chance to play the TD25KV-S kit. It had everything I was looking for. Good feel, great sounds, expandability and durability. Of course the price was a bit off putting, Especially since I would have to buy the Kick pedal and the high hat stand. I saved for a few extra weeks and went back and forth to both my Yamaha dealer and my Roland dealer and would him and haw over them. Finally it came down to the Roland kit. The look, the feel and sounds won over the price tag. I brought the kit home and my son and I set about setting up the kit. The smiles on his face said it all. I made the right choice, and the best choice for my budget. Is it a BIT much for home use, practicing and just playing around? OH YEAH it is. But I’ve grown up and learned that when you are making a large ticket item purchase, ALWAYS go with the best that you can afford at the time. Neither myself nor my son are anywhere near professionals, heck he’s just a kid and really just learning. I’ve been playing off and on over 30+ years, never had any “formal” training. I just play along to what I’m listening to and have fun. Because honestly that’s what it’s about. having fun with what your doing. Now a small comparison. The mesh heads of the Alesis versus those of the Roland. The Roland heads feel much better designed and built. Having multiple zones per head also makes a HUGE difference. So, price tag set aside. Sure, you get a little more with the Alesis kit than you do initially with the Roland kit, it takes a bit more investment with the Roland kit. But it also gives you more appreciation for what you just bought. That’s amazing – thank you SO much for giving such a detailled account of your experience with the Roland TD-25KV! I’ve linked to it from within the article, since I’m sure this will be of tremendous help for any other reader coming here. I highly appreciate your contribution!